Click here to read the full posting on the 11th anniversary passing of the Notorious One. 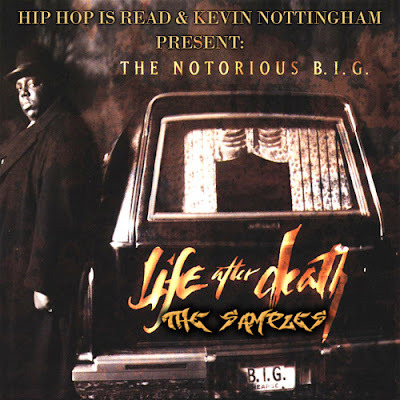 The fine folks over at Hip Hop Is Read collaborated with Kevin Nottingham in making it easier for us as fans of Life After Death by uncovering the samples that were used for the classic double disc album. Kevin and I wanted to do something special for today, the 11th anniversary of the passing of Brooklyn's finest, The Notorious B.I.G. We split the samples on 'Ready to Die' a while back, and it was only right that we follow up with his equally influential sequel album 'Life After Death'. A double-disc record, 'Life After Death' had a very ominous element attached to it - due in large part to its release. The album came out mere weeks after the fatal shooting which took Biggie away from the physical. But his music was as vibrant as ever, with scores of tracks which remain staples on the radio and classics to heads all over the world. On this day of remembrance, make sure to blow Biggie's music out your speakers... as well as this great sample set!